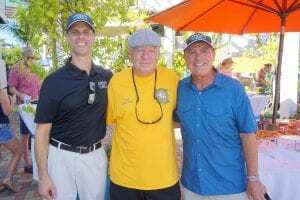 Romance is in the air this Valentine’s Day at Matanzas on the Bay on Fort Myers Beach. Sweethearts can enjoy a romantic date night experience on Thursday, Feb. 14 in an intimate waterfront setting with a dinner special, featured cocktail and live music. In addition to its regular menu options, Matanzas on the Bay will offer its Surf & Turf Trio for $32. 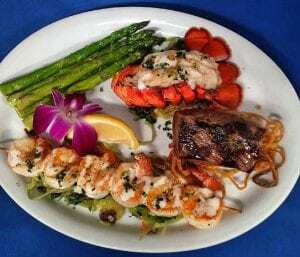 The dish features a 4-ounce cold-water lobster tail, 4-ounce sirloin and six gulf shrimp, served with a choice of side. Guests can also sip on a special Valentine’s Day cocktail, a red sangria, for $8. Offerings are available starting at 4 p.m. and while supplies last. 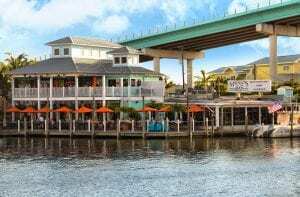 An idyllic destination for any Valentine’s Day date, Matanzas on the Bay is nestled along the back bay of Fort Myers Beach. Guests can choose to dine indoors or on the outdoor deck, accompanied by a waterfront view. Live music will also be performed throughout the evening with local artist Mary Winner taking the stage from 5 to 9 p.m.
Walk-ins will be accepted on Valentine’s Day, and free car parking and boat dockage is also available for guests traveling by land or sea.